This MAb recognizes a 60 kDa antigen associated with the mitochondria in human cells. HeLa or HepG2 cells. Hepatic carcinoma. This MAb recognizes a 60 kDa antigen associated with the mitochondria in human cells. It can be used to stain mitochondria in cell or tissue preparations and can be used as a mitochondrial marker in subcellular fractions. It produces a spaghetti-like pattern in normal and malignant cells. 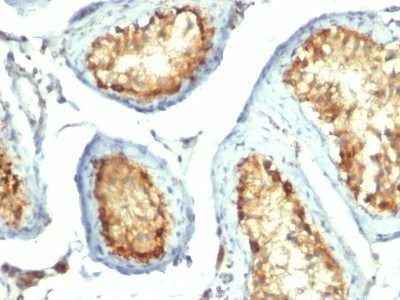 This antibody is an excellent marker for human cells in xenographic model research. It reacts specifically with human cells, including neurons and embryonic stem cells. 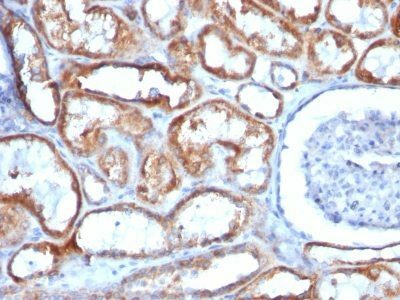 Immunostaining pattern with anti-mitochondrial MAb has been reported as a useful discriminatory adjunct in the complex differential diagnosis of granular renal cell tumors. 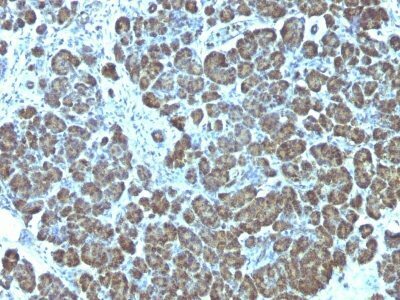 Reportedly, this MAb facilitates the classification of salivary tumors. Catalog number key for antibody number 0739, Anti-Mitochondrial Marker (113-1) The prefix indicates conjugation, followed by the antibody number and size suffix. Tickoo SK, Amin MB, Linden MD, Lee MW, Zarbo RJ. Antimitochondrial antibody (113-1) in the differential diagnosis of granular renal cell tumors. Am J Surg Pathol. 1997;21(8):922-30.